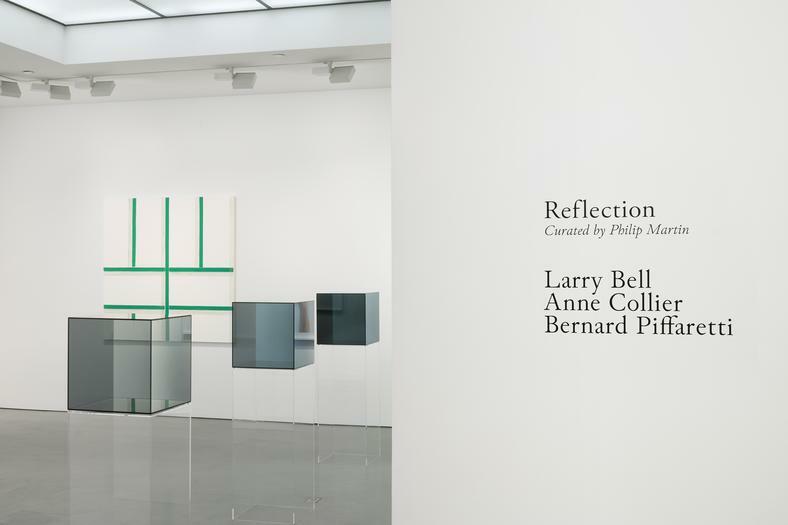 Andrea Rosen Gallery is pleased to present “Reflection,” an exhibition featuring the cube sculptures of Larry Bell, the photographs of Anne Collier, and the paintings of Bernard Piffaretti. In their respective practices, these three artists ask questions about what art objects are, how they work, and how they are perceived. 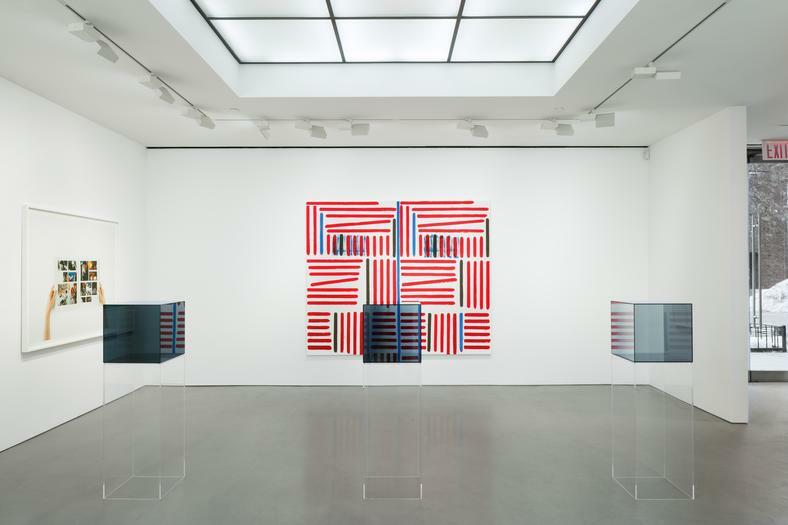 ‘Reflection’ in the work of these three artists is something physical and intellectual, figured by representation and interpretation, shaped by the looping assumptions of art viewing and popular culture alike. 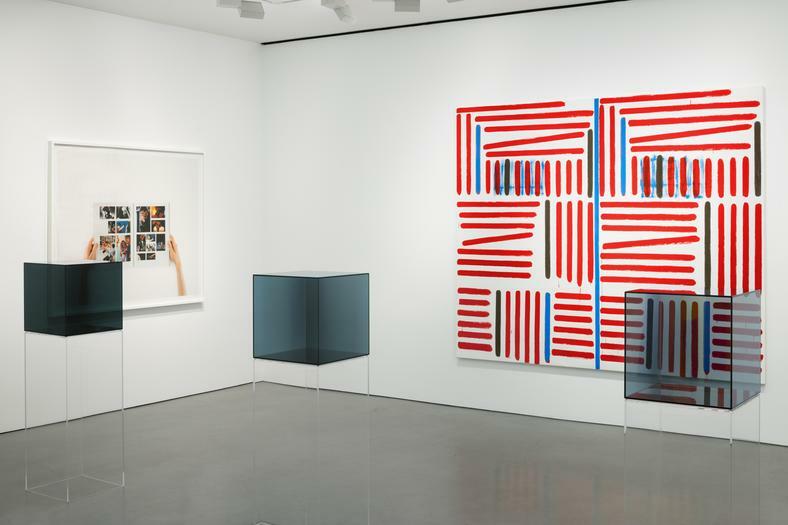 In the early 1960s, the gestural oil-on-canvas paintings of Los Angeles-based artist Larry Bell’s student years made way for shaped canvases and glass constructions. By 1965, Bell was making vacuum-coated glass cubes. In these works, the expressionist brush strokes of his early paintings are replaced by the effects of a vapor evaporator, a piece of specialized machinery that allowed Bell to apply subtle gradations of translucent color. Bell’s seemingly ‘touchless’ cubes were interpreted as the product of technology. As Bell has stated, “my work is for the dreamers” – opening up the possibility for looking and seeing in as pure a way as possible – using physics in the service of the sensuousness of individual human vision. For over 15 years, Los Angeles-born, New York-based Anne Collier has made photographs that examine photographic representation and practice. As Collier points out, the taking and making of photographic images requires constant manipulation. Her choices in the framing of an individual photograph, for example, determine what is or is not included in a given image. The constructed nature of all photographs means that, as Collier states, “you are constantly made aware of how a photograph edits things.” Making a photograph is thus not a simple act of recording. Reinforcing her investigation of the forces at play in photographic imagery, Collier photographs pre-existing image-driven consumer objects: record album covers, popular magazines, film stills, etc. Shot by Collier against neutral studio backdrops, the objects she chooses are seen to embody the language of social and material desire, and reflect the values of our culture as engendered by each of us individually - in our gaze and in our interpretations. Since the early 1980s, Paris-based Bernard Piffaretti has approached the blank canvas with a first mark: a single line that he paints down the center of each work. This first mark has been described as “a sort of question,” rather than a defining line, a statement, or a figure in space. Piffaretti paints a composition on one side of this line and then paints a duplicate on the other side of it; FRAC Franche-Comté curator Sylvia Zavatta writes that, for Piffaretti, that first line opens up “the distance he needs to concentrate on his real purpose: painting itself.” Piffaretti’s paintings incorporate both individual expression and duplication of that expression into the final art object. His paintings are primary sources marking the original spot of expression, and also secondary sources that translate for Piffaretti- and for us - the experience of that expression. In looking at Piffaretti's work, our eyes move through his compositions, matching color and shape, line and texture in a dynamic, yet strangely looping fashion that wraps back upon itself. 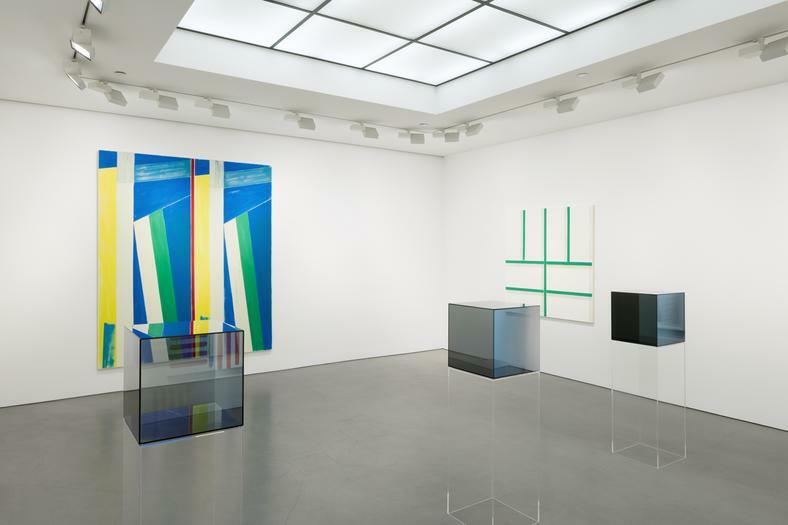 Larry Bell (b.1939) has exhibited widely, including the group exhibitions “Larry Bell, Robert Irwin, Doug Wheeler,” (Tate Britain, London, UK); “11 Los Angeles Artists,” (Hayward Gallery, London, UK) and “Phenomenal,” (Museum of Contemporary Art San Diego, San Diego, CA). Solo exhibitions include the Pasadena Art Museum (Pasadena, CA); Fort Worth Art Museum (Fort Worth, TX); Museum of Contemporary Art (Los Angeles, CA); Denver Art Museum (Denver, C0); Carré d’Art Musée d’art Contemporain de Nîmes (Nimes, France); and The Chinati Foundation (Marfa, Texas). Anne Collier (b.1970) has recently held solo exhibitions at the Aspen Art Museum (Aspen, CO); Art Gallery of Ontario (Toronto, Ontario); and Museum of Contemporary Art (Chicago, IL). Her work has been included in such recent exhibitions as “Photo Poetics” (Guggenheim Museum, New York, NY); “America Is Hard To See” (Whitney Museum, New York, NY); and “UGO RONDINONE : I ♥ JOHN GIORNO” (Palais de Tokyo, Paris, France). Collier’s exhibition at the MCA Chicago was accompanied by the monographic text, “Anne Collier” (2014), with essays by Michael Darling and Chrissie Iles. Bernard Piffaretti’s (b.1955) work will be the focus of a survey exhibition at the Centre Pompidou in 2017. Piffaretti’s work was recently the subject of two-person exhibition with Martin Barré at Musée des Beaux Arts de Nantes. Karma, New York will release a new English-language book on Piffaretti’s work in early 2016. 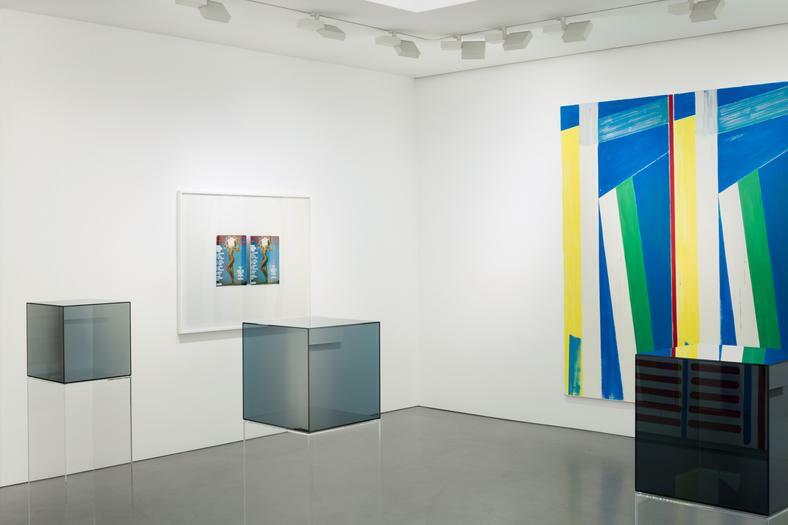 Recent solo exhibitions include the FRAC Franche-Comté, (Besançon, France) and Cherry and Martin, (Los Angeles, CA). A new monograph on Piffaretti’s work, with texts by Marie Muracciole and Jens Asthoff, will be published in 2016 by the Museum of Modern and Contemporary Art (MAMCO), Geneva. Karma New York will also be publishing a new book on Piffaretti’s work in 2016 with a text by Paul Galvez.